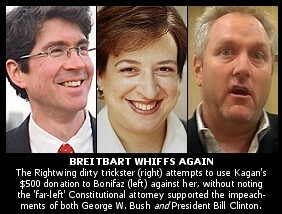 May 20, 2010- Taking a page from the successful hit campaign the Republican right ran against former White House Green Jobs Advisor Van Jones, one of rightwing activist Andrew Breitbart's website's "Andrew Breitbart Presents...Big Journalism," is now attempting to use a McCarthy-like guilt-by-association smear against Supreme Court nominee Elena Kagan. This time, the bizarre --- and ill-researched --- claim against the Democratic President's nominee to the High Court is that she has made political contributions to Democrats. Not just any Democrats, mind you, but, as Breitbart's blogger Morgen Richmond informs us in his scoop today --- which, he notes twice, "every media outlet has either failed to report, or missed" --- Kagan made a "maximum ($500) contribution" to noted Constitutional attorney, author, voting rights advocate, and former Democratic candidate for Massachusetts' Secretary of State, John Bonifaz. Richmond describes Bonifaz, who is now the Legal Director of the non-partisan election integrity advocacy organization VoterAction.org, as well as the author of 2003's Warrior King: The Case for Impeaching George Bush as being "about as far left as you can get before joining the Bernie Sanders fan club." The far Right blogger goes on to detail five points which he believes underscores Bonifaz' "left"-ness, including his founding of the National Voting Rights Institute in 1994; his co-founding of AfterDowningStreet.org (a non-partisan website created original to demand accountability following British evidence suggested Bush had lied to Congress about the case for WMD in Iraq); his former board membership of Progressive Democrats of America ("whose platform includes ending the wars in Iraq and Afghanistan," warns Richmond! ); and, of course, his support of the impeachment of George W. Bush.